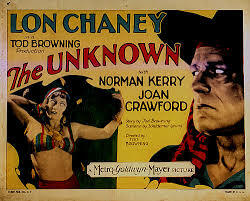 The Unknown (1927) is one of the final masterpieces of the silent film era. Suspend disbelief and step into the carnival of the absurd. 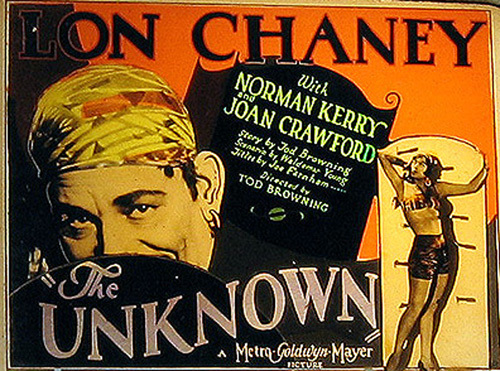 The Unknown is the ebony carousel of theTod Browning/Lon Chaney oeuvre, the one film in which the artists’ obsessions perfectly crystallized. This is a film uniquely of its creators’ time, place and psychosis and, therefore, it is an entirely idiosyncratic work of art, which has never been remotely mimicked, nor could it be. That it was made at MGM borders on the miraculous, or the delightfully ridiculous, but then this was an era of exploratory boundaries, even at the big studios (again, the risk-taking Irving Thalberg produced). Illusions abound. Alonzo is actually a double-thumbed killer on the lam. With the aid of a straight jacket and midget assistant Cojo (John George, who worked with Browning in Outside the Law 1920), Alonzo feigns his handicap and performs the facade of one mutilated. In addition to evading the law and securing employment, Alonzo’s act of the armless wonder benefits him greatly. Nanon has a hysterical, obsessive repulsion to the very touch of a man’s arms. She calls on the Almighty to take away the accursed hands of all men. Nanon vents histrionic, sexual anxiety to Alonzo every time Malabar the Mighty (Norman Kerry) puts his vile hands upon her. Alonzo, ever the performer, simulates expressed sympathy, although his affection for Nanon is the one thing about Alonzo that is genuine. Alonzo, secretly venting enmity, advises Malabar on how to win Nanon. It is, of course, intentional ill-advice which will eventually karmically rebound and become genuine ill-advice for Alonzo. Malabar’s arms are muscled and strong, compared to Alonzo’s armless torso, or compared to Alonzo’s deformed, hidden double thumb—the very same double thumb which he used to strangle the ringmaster of Browning’s perverse milieu: Nanon’s sadistic father, Antonio Zanzi (Nick Ruiz, hinted at being the abusive source for Nanon’s hatred of a man’s touch). After Alonzo swears to care for her, Nanon embraces him, to the alarm of Cojo. The loyal Cojo fears that Nanon will discover Alonzo’s secret. But, Alonzo must have, marry, and own Nanon, despite the fact that she hates the hands of all men, and would certainly hate the hands of the double-thumbed murderer. 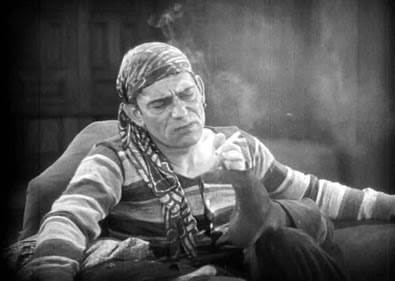 An alluring shot of Crawford, filmed through gauze, gives way to a mesmerizing, humorous scene of Alonzo lighting his cigarette with his feet, long after removal of the binding straight jacket beneath his coat (shades of Freaks-1932-to come). Cojo laughs at the irony. Alonzo is perplexed. “Look, Alonzo, you are forgetting that you have arms!” Aghast, Alonzo looks at the cigarette between his toes and the freed, cursed hands which keep him from possessing Nanon. Repulsed, Alonzo clutches the arms of the chair. The revelation of his dilemma provokes a flow of maddening tears, which evolves into abject horror and gives him the terrifying answer: a a martyrdom of emasculation, all for unrequited love. “Not that, Alonzo!” Chaney’s intense concentration obliterates all doubts. If we were not terrified, we would laugh insanely with him. Alonzo goes to see the underworld surgeon. When the doctor inquires into Alonzo’s desire, Alonzo pantomimes a slash across his shoulder. This is an amazingly acted, unsettling scene in which Chaney’s simple pantomime slash solicits genuine shock and shudder. 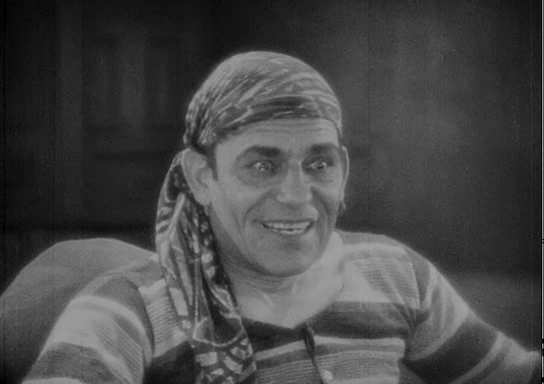 After a long recuperation, Alonzo goes to see Nanon, who is astonished at his withered appearance, which he explains away as the result of having “lost some flesh.” Chaney’s meltdown scene has been much written about. Burt Lancaster listed it as the greatest acting scene in all of cinema. 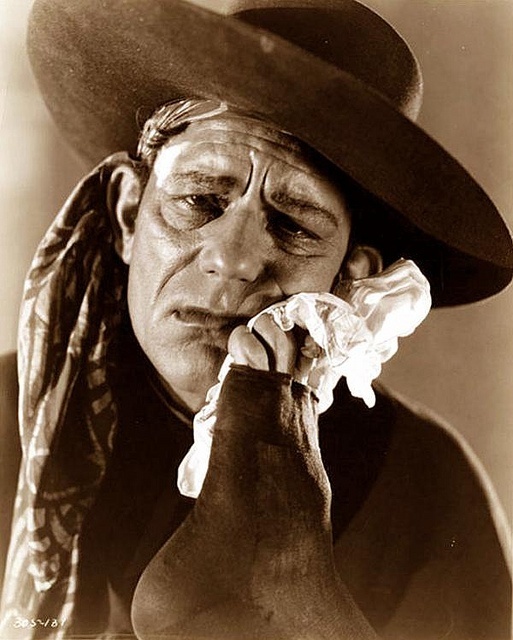 Chaney expresses A teary-eyed gleam, wistful yearning, brooding, barely concealed jealousy, tragedy, hysterics, and fatigued collapse from the masochistic futility of his sacrificial mutilation all within a matter of seconds. Forced to perform yet again, Alonzo must mask his true reaction as Nanon kisses hands that she no longer fears. Nanon unwittingly mocks Alonzo’s sacrificial maiming. 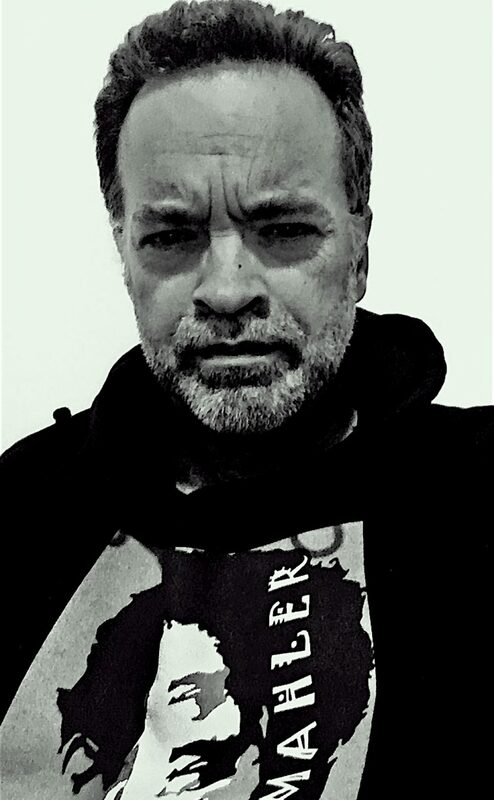 Despite Alonzo’s web of lies, his facade, his cruel betrayal of Cojo and maliciously plotting ghastly revenge, Chaney has our unmitigated sympathy. 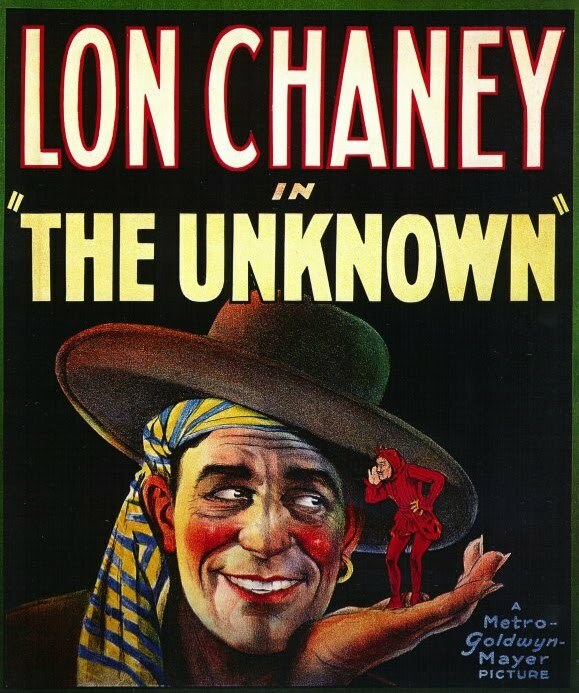 Chaney makes us understand and root for the misunderstood. God bless the freaks. 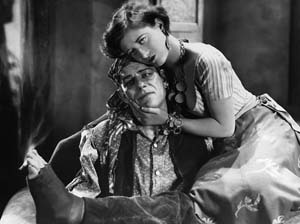 It is only fitting that Chaney, the quintessential performer, climaxes as the performer pathological. And only Tod Browning could have directed this lurid, deliriously surreal pulp melodrama/debauched fairy tale without batting an eyelash once. Browning’s sincerity is contagious and spellbinding during the film’s brief 50 minute running time, which ends with a startling, ferociously driven, symbolic finale. For many years The Unknown was thought lost. All but 15 minutes of the film have been recovered, which may give a glimmer of hope for those awaiting the discovery of the infamous London After Midnight (1927). Until then, only a still photo restoration of Midnight exists. 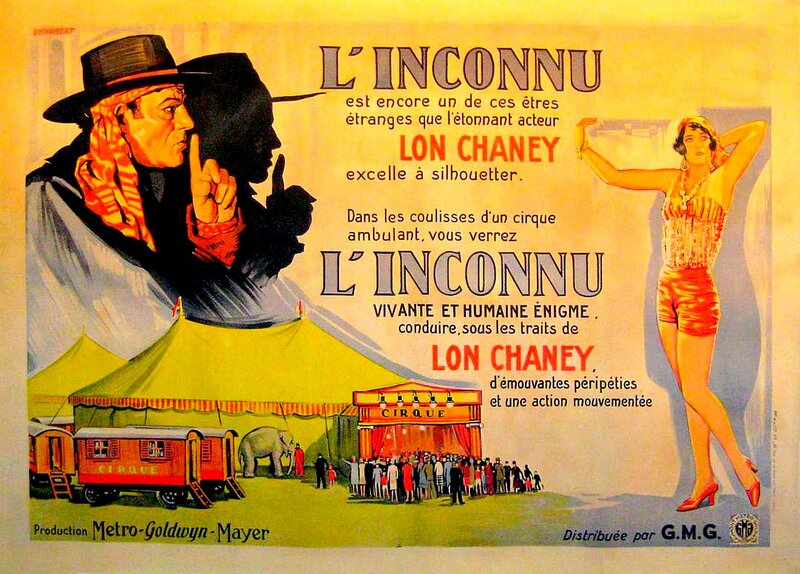 This entry was posted in BLUEMAHLER'S WORLD OF SILENT CINEMA, Film Reviews and tagged Irving Thalberg, Joan Crawford, John George, Lon Chaney, Norman Kerry, silent, Tod Browning by Alfred Eaker. Bookmark the permalink.